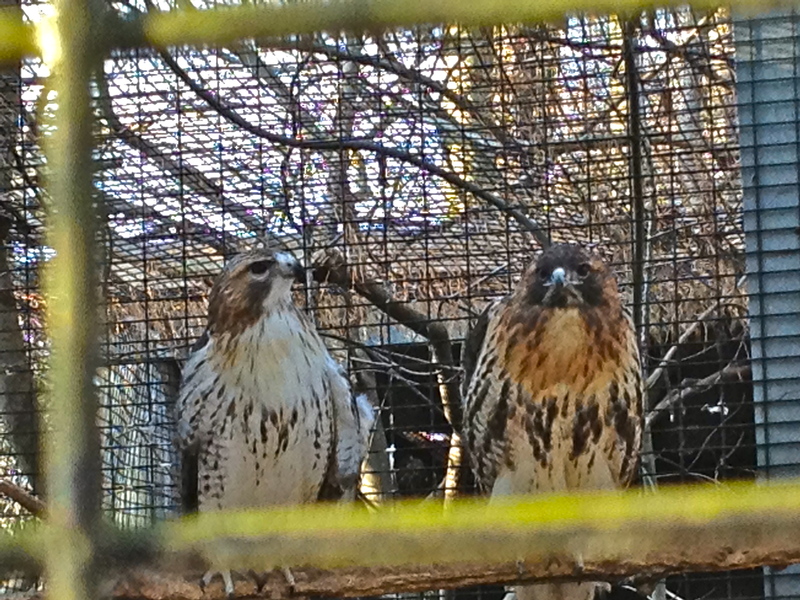 My photo today features a pair of Red-Tailed Hawks residing at the Quogue Wildlife Refuge. The darker breasted hawk is female, and the paler breasted hawk is male. Both birds live at the refuge due to serious wing injuries (the female was hit by a car, and the male wounded in a hunting incident). Together they seem to have found companionship as they live out their lives happily protected and safe at the refuge. I found the following description of the Red-Tailed Hawks’ courtship & mating behavior very interesting — Enjoy! During courtship, the male and female fly in wide circles while uttering shrill cries. The male performs aerial displays, diving steeply, and then climbing again. After repeating this display several times, he sometimes grasps her talons briefly with his own. Courtship flights can last 10 minutes or more. Copulation often follows courtship flight sequences, although copulation frequently occurs in the absence of courtship flights. In copulation, the female, when perched, tilts forward, allowing the male to land with his feet lodged on her horizontal back. The female twists and moves her tail feathers to one side, while the mounted male twists his cloacal opening around the female’s cloaca. Copulation lasts 5 to 10 seconds and during pre-nesting courtship in late winter or early spring can occur numerous times each day. Please click here to return to feature photo: Mars and Venus on a Perch « THROUGH THE HEALING LENS. Love this! Did you read Rebecca the ‘story’ – or was that just from the photo? She is precious. Thanks for sharing! Awww.. Angelo I have read much by Kahil Gibran but don’t recall this one. It is perfect for this post – and actually for many of the other birds with wings no longer able fly freely in the wild! I will add this to my poetry section here on the blog and provide a link from this post!! Thank you! Are you sure they aren’t lovebirds? 🙂 We have a variety of hawks here. These two are in a special place, that’s for sure!